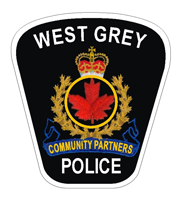 On March 30, 2019 West Grey police officers were able to execute warrants on two individuals from two separate occurrences as a result of assistance from outside police agencies. One individual was arrested and released on an undertaking and a promise to appear in court. The other was held for a bail hearing and is still in custody at the time of this release. On March 31, 2018 West Grey police officers participated in a truck pull against other emergency services in support of the Trek for Tourettes event in Ayton. West Grey Police Service had the highest fundraising total and fell just shy of the time established by the Hanover Firefighters. Congratulations to the winners and we look forward to next year! On March 31, 2019 West Grey Police Service responded to a report of an unknown, shoeless male running in a field at a property on Highway 6. The male party was apprehended under the Mental Health Act and transported to a nearby hospital. On April 1, 2019 officers responded to the downtown core of Durham and cautioned the same male party under the Municipal bylaw for loitering. That same day, this male party was captured on video from a local business stealing a vehicle. The 32 male of no fixed address was arrested with the stolen vehicle on April 2nd and remains in custody at this time. On April 1st an alert officer on patrol identified a pedestrian as a male party wanted by Grey County OPP. When approached by police, the male identified himself as someone else. He subsequently fled on foot through the backyard of a house. Officers were not able to locate him. A warrant for his arrest charging him with impersonation, breach of recognizance and Trespass at Night is being sought. These charges are in addition to the charges he is already wanted for. On April 3rd an officer initiated a traffic stop of a vehicle in the former Normanby township. A passenger in the vehicle identified himself as his older brother. The 26 year old male from Hanover was placed under arrest for impersonation and for breaches of conditions previously imposed on him by the courts. He was held for a bail hearing and remains in custody at this time. On April 3rd police received a call about a mischief that had occurred in the parking lot of a church in the former Bentick township. Sometime on April 2nd or 3rd, a vehicle entered the parking lot and proceeded to do “donuts” causing damage to the parking lot. Anyone with information about this crime is asked to contact the West Grey Police Service at 519-371-6911 or Crime Stoppers at 1-800-222-8477. On April 3, 2019 police responded to a report that a vehicle had been stolen from a business in Normanby township. The owner advised police the vehicle had been unlocked and the keys were inside. The vehicle was located by police, undamaged, a short distance away. This investigation is ongoing and anyone with information about this crime is asked to contact the West Grey Police Service at 519-371-6911 or Crime Stoppers at 1-800-222-8477. With the nice weather approaching, the West Grey Police Service would like to remind the public to always lock car doors and never leave your keys inside the vehicle. In the early morning hours of April 5, 2019, an officer on mobile patrol conducted a traffic stop after a vehicle accelerated past him at a high rate of speed. The driver, a 36 year old male from Barrie, was found to have a suspended driver’s license and was charged accordingly. The vehicle was towed and the male was transported to a safe place to await a ride home.